OMEGA's PX01 is a very high accuracy, low-noise, 4 to 20 mA output industrial pressure transmitter. Its all stainless steel construction and hermetically sealed case make it suitable for harsh environments. A broad temperature-compensated range of 15 to 71°C (60 to 160°F) makes this transmitter very stable with fluctuating temperatures. The PX01 is available in gauge, absolute, or sealed models, as well as in psi or metric ranges. NPT and 7/16-20 O-ring seal fittings are available for industrial and Hydraulic applications. The PX01 is also available in metric configurations, with G1/4 or G1/8 ports, and models from 0-160 mbar to 0-400 bar pressure ranges. Please see the PXM01 for complete details, or contact our Sales department for more information. Electrical Connection: PTIH-10-6P or equal. 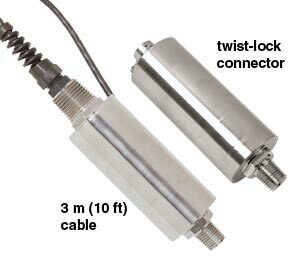 Also available: 3 m (10') 2-conductor cable; explosion proof amplifier housing. (3) All Gauge Pressure ranges are also available in Sealed Gauge Pressure.